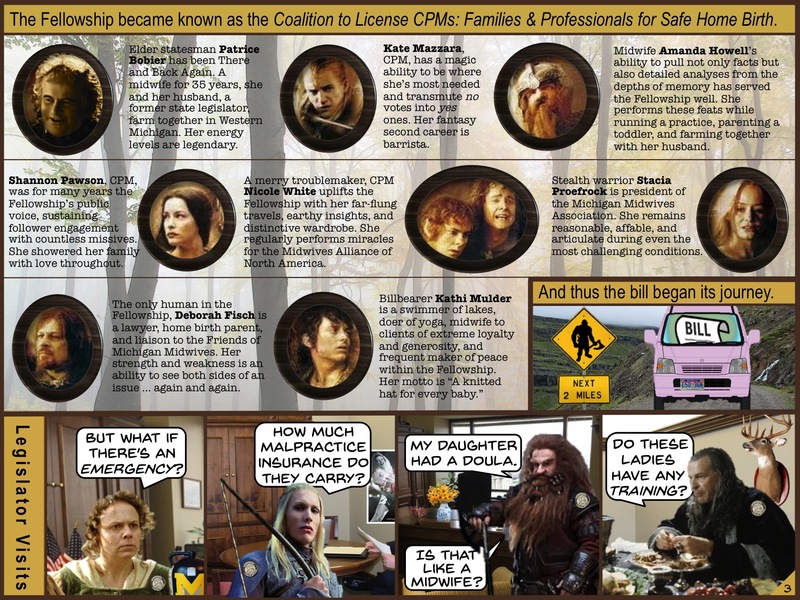 The chronology of the Fellowship is worthy of a document of its own (Frame 1). Originally a committee of the Michigan Midwives Association, it gradually moved to admit a consumer member from the Friends of Michigan Midwives. In order to present a unified front in Lansing, the group eventually changed its name to the Coalition to License CPMs: Families & Professionals for Safe Home Birth. Frame 5. The little brown jug – although here it is blue. Frame 6. Ted Nugent concert poster. Frame 7. Vase of Black-Eyed Susans. Frame 8. Mounted deer head. The Coalition remarked that a legislator’s party affiliation could be inferred from the presence or absence of mounted animal parts. The background for each of these frames is a bona fide space in Michigan’s Anderson House Office Building, in which the Fellowship passed many productive hours.